We encourage students and teachers to participate in our construction site projects – participating in simple construction works supervised by qualified instructors. It is necessary to have a group of at least 10 people who are 16 years old or older and would like to spend at least 1 day volunteering with Habitat Poland. 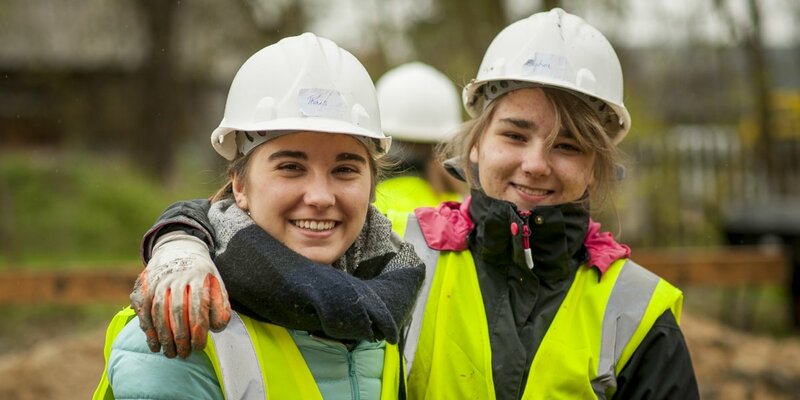 All interested groups should contact our volunteering coordinators (wolontariat@habitat.pl) in order to learn when and what construction projects we could offer you to help in, so that we could include you in works suitable for young volunteers. We encourage you to read the Frequently Asked Question section on participating in construction projects. I am 17 years old and would like to participate in youth volunteering at a construction site. Can I do it? Individuals, who are 16 years old or older can participate in our construction and renovation projects. If they are underage, it is necessary that the volunteering contract is signed also by their parent/legal guardian. How does a typical volunteering event look like? Every event begins with a safety training, during which the site manager introduces the safety measures and conditions on the site, explains what kinds of tasks will be undertaken and the volunteering coordinator presents the schedule. Volunteers receive safety gloves, helmets and if necessary – masks, overalls and tools necessary for work. Every participant receives training related to the scope of their work and during the whole event remains under guardianship and supervision of the trainers. During the event there is time for meal breaks and depending on its length – lunch. Usually it is 9am-2pm or 9am-4pm, but it might change due to many factors. Foreign volunteer groups usually take part in several days-long projects. Do I have to have construction/renovation experience? No, such experience is not required. It is the willingness to learn new skills that counts. Our instructors will explain to you how to perform each task and will answer all your questions. What should I wear? What should I take with me? Take comfortable clothes – something you can damage or get dirty in. Remember about solid shoes with thick soles. When it comes to the tools, water and snacks – they are all provided at the site. Before the event, familiarize yourself with the volunteer statement (template above – question 1) and if you have a chance, bring it printed out and signed.